We had a fantastic week at Quinta das Achadas. Jill and Julio are great hosts who provide invaluable advice on local beaches, restaurants and other destinations. It is a great base for exploring the beaches on the south and west coast as well as Lagos and other attractions. Our children loved everything about the holiday, but particularly the pool, the play area and the pigs! We even managed to relax with three boys aged six and below which is something we have not managed in a while! Breakfast was lovely with the bacon and eggs a real highlight for the whole family. We also really enjoyed the two evening meals, meeting fellow guests and eating Jill and Julio's excellent food. The apartment had a lovely living and kitchen area so we could choose between eating in or out depending on our plans for the day. We all had a brilliant week and are keen to return! The Quinta is so beautiful and the girls enjoyed having their own bit of privacy. It was lovely to meet you both, thank you for your hospitality, cooked breakfasts, recommendations of all the amazing places we ate in and beaches we sat on. Another beautiful memory for our family. We look forward to seeing you again very soon we hope. We had fabulous 10 day holidays in Quita Das Achadas, different to hotel resort, this converted farm house has it's own character and charisma, it's very children friendly with all the toys and games they could play with, a beautiful pool with perfect temperature. The flat was comfortable and daily cleaning service comes handy. Jill and Julio know almost everything about Algarve, they pointed direction to us to local farm market, best place to get sea food, recommended good restaurant to dine out. Julio showed me the location of the perfect place for enjoying Sunset in the Southwest corner of Europe! Our 4 and a half yrs old boy really enjoyed time there too, he made some friends during our stay, also enjoyed playing with dogs and cat there. Superb place and will come back again. Many thanks to Julio and Jill! A perfect week in all respects! The Quinta is as welcoming as we remembered it and Julio & Jill are genial hosts. The sunny weather enabled us to enjoy some great walks along the spectacular coastline and inland. Excellent location, great accommodation and facilities and tremendous hosts. Our 10 year old thoroughly enjoyed the swimming pool and hot tub, but Lotti the retriever pup, stole the show. Many thanks Julio and Jill. We came for a holiday based in a setting in which we might know who the hosts were. With Jill and Julio we hit the jackpot: a genuine and warm couple running a pretty and well cared for Quinta. The gentle sociability of the place works well, with the positives of getting to know fellow guests, being able to share ideas and discoveries but without any sense of intrusion. We stayed for a week, in late September, in the very spacious, well equipped and tastefully decorated Bouganvillea apartment set in lovely surroundings. The gardens are relaxing with a swimming pool and an up-market Jacuzzi to take away and aches and pains. To be able to watch UK television and to access the free Wi-Fi was certainly a bonus. There is also an honesty bar if you are feeling thirsty or would like a nightcap. Jill and Julio are fantastic hosts catering for your every need with fantastic knowledge of the area and suggestions for good places to eat. We enjoyed having our breakfast outside at our own table and we would certainly recommend taking up the optional dinners when offered. We would definitely recommend staying at the Quinta and we hope to return. The holiday with our 16 month son was all that we had hoped and needed. Great location for getting to one of many beautiful beaches and the Qunita had loads to explore and enjoy for our son. We loved the breakfasts on our patio and the hosted dinners were a real treat. A very special place, with 2 very special owners which created 'the best holiday ever' according to my children. Rightly so. A beautiful, beautiful place, wonderful Jill and Julio who give so much time, attention and knowledge when asked, yet very peaceful and private too. Breakfasts were wonderful, with lots of freshly picked fruit from the trees in the garden, and a superb dinner. 5 star people, 5 star place, thank you. We had a truly relaxing holiday, which we weren't expecting to have with a 9-month old baby! Jill and Julio were very friendly, laid back and accommodating. We loved our mornings in the cabana by the pool. The area is great - lovely towns, great beaches and all very child friendly. Thank you. We've just returned from a wonderful week in the Jasmine apartment at Quinta das Achadas. The setting is wonderful - close enough to the main beaches but far enough away to feel peaceful and relaxing. Our 18month old daughter loved the toys, pigs, chickens and the new puppy Lottie. The hosts Jill, Julio and Izzy were wonderful and the communal meals a complete delight. We can't recommend this place more highly. Don't hesitate to book! What a lovely time myself, Nicky, Jake & Gail had at Quinta das Achadas last week. The gardens are lush and verdant with splashes of brilliant colour provided by bougainvillea & geraniums in terracotta pots. The accommodation is rustic and Portuguese in style. The rooms are beautifully furnished, with nice firm beds & crisp linen. The cabana area is great, perfect if you have young children who are happy to play in the shade while you catch some sun poolside. With Jill back in the UK visiting family, Julio looked after us in his laid back Portuguese style which suited our group perfectly. Julio has a wealth of knowledge about the local area, so if there's anything you want to know, just ask. We also got to sample some of his home cooking, big juicy prawns, pork kebabs and avocado salad, served up with plenty of wine and lashings of that dry sense of humour! It's a 10/10 from me. We had a fabulous week staying with Jill and Julio. The Quinta is in a lovely setting and the gardens are very lush - so it is easy to find a quiet space in either sun or shade. The heated pool was perfect for a relaxing swim after a long walk - and the children in the other parties obviously loved it. We stayed in the Bougainvilla apartment, which has its own terrace where we ate breakfast every day. It was very nice to have dinner at the Quinta on some evenings - the food was fantastic and it was a very leisurely and sociable evening. A car is essential, but the roads are quiet and it is easy to drive to the west coast or into the mountains. There are some good coast walks a short drive away and it is sometimes possible to catch a bus back to your starting point. Thank you for a fantastic week at the Quinta. It is a perfect place for families with young children. Matthew loved exploring with our friends children, while we sat and relaxed!! The pool and hot tub were a big hit, but above all we were made to feel so welcome by the owners, Julio and Jill, who were so kind and helpful with everything from the lovely dinners to giving us ideas on places to visit. 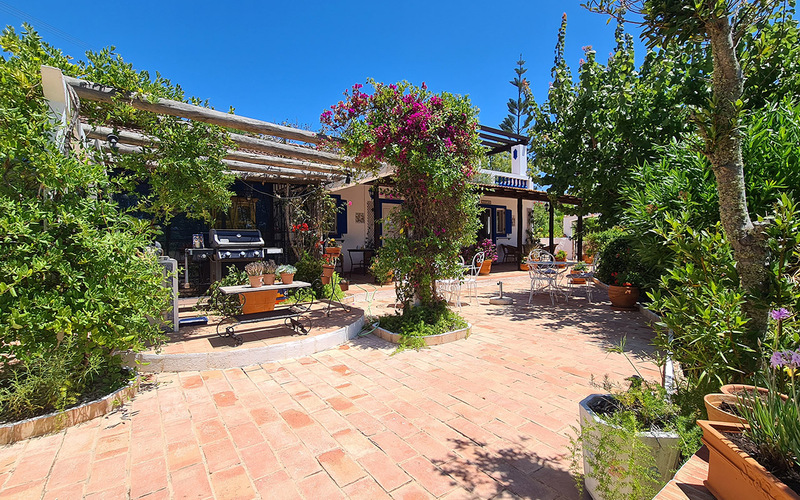 The Quinta is also perfectly situated, you are in the countryside with open fields all around, but only 10 minutes drive from Lagos, with loads of great beaches and restaurants. Thank you for a great week, we would love to come back! What a great stay we had. From the beautiful communal dinners to getting me sorted with doctors and hospitals when I did my back, nothing was too much. From lazing by the pool to running around after Olivia, everything was perfect in this tranquil place. All the recommendations were brilliant and kept the three of us entertained every day. Thanks so much for looking after us so well, we'll see you again soon. We have just returned from our second holiday at the Quinta, this time we brought friends who loved it as much as we do. It is perfect for families as there is so much for the kids to explore and enjoy. Thomas loved being thrown around in the pool, relaxing in the hot tub and the 'parties' Jill and Julio host with delicious home cooked food and great conversation. Sophia loved picking almonds, bringing eggs fresh from the chickens for Jill to cook for breakfast and feeding the pigs. They were both very sad to leave and both want to set up home in Portugal now! I can't recommend this wonderful place highly enough, we will definitely be back. I've just returned from a fantastic holiday with my wife and two young children at Quinta das Achadas. The accommodation and surrounding facilities are fantastic but the thing that really makes this holiday stand out is the warm hospitality provided by Julio and Jill. They were always on hand to provide information on activities in the local area and went the extra mile to arrange entry to a local country club swimming pool on a rainy day. The breakfasts and evening meals were great and very sociable. I'm looking forward to returning next year. A beautiful and tranquil spot in an area we hadn't visited before. Jill & Julio were perfect hosts and most welcoming and attentive, especially as I brought the 'flu with me. We'll certainly visit again to tick off the walks we didn't manage! Finding somewhere which ticks all of our boxes as a family with three young children and a rather discerning husband is not an easy task. This is an absolute gem for families with young children. The apartment had everything we needed as well as the luxury of Senora Rosa who came in every morning to clean, make beds, do the washing etc and a cooked breakfast every morning. We didn't need to bring anything with us. All necessary baby gear was provided as well as toys, games, books, DVDs and loads of bits and bobs for the pool and the beach. The main selling point for this place is the owners. Julio, Jill and Gloria were on hand to help plan itineraries for days out with the kids. Being so family friendly they know exactly where to go which was invaluable. Quinta das Achadas provides the perfect combination of the flexibility of self catering with all the help you could need or want with a personal touch. Right up our street. Most unlike us to say it but we definitely will be back. We very much enjoyed our stay - a great place and perfectly located. We had spent a VERY long time looking for somewhere to have a relaxing holiday in the sun with our toddler, and had come up with a long list of requirements that were getting increasingly difficult to meet, especially on our budget. The fact that the Quinta das Achadas not only met all of our needs, but exceeded our expectations tells you what a a very special place it is. We stayed for a week in late October in the Bouganvillea apartment. Other families with young children were staying at the same time as us, which worked out wonderfully for us - playmates for our son and great company for us. We all shared two delicious meals, prepared by Julio and his mum, which created a lovely friendly atmosphere. The Quinta had so much to offer (a large, heated pool, an outdoor and indoor play area, chickens, pigs...) and the apartment was so well-equipped that some days we didn't go anywhere else except the supermarket. It was a wonderful place for our son to play and for us to relax. The rural setting of the Quinta is just gorgeous, with beautiful tropical plants everywhere, and the sun shone for us every day, which was a huge bonus. Even though the Quinta is close to a small town (and a short drive from the large town of Lagos), it had the perfect "away from it all" feel to it. We have never been the types to return to places we've visited, as we're always too keen to explore new areas. However, we think we might make an exception for this place. We would whole-heartedly recommend the Quinta as somewhere to properly relax and be looked after by warm and laid-back hosts. Thank you Julio and Gloria! We have lost count of the number of times we have visited the Quinta and it remains our favourite bolt hole in the Algarve. We love the surrounding area and after all these years we are still finding different places to visit, restaurants to eat in and beaches to stroll along. Being located near both the south and west coast provides a lot of scope for exploring delightful fishing villages, rugged coastlines on the west and not to forget the lovely hillside towns and villages. Of course if you just want to laze around the Quinta pool or relax and read a book in the cabana, there's no better place! The welcome we always get from Jill and Julio is second to none - they are without doubt a genuinely lovely couple who throw themselves into running the Quinta and making every holiday memorable and fun. The rooms and apartments are very comfortable and well equipped. Breakfasts and the weekly evening meals are delicious and it is not difficult to put on the pounds with such good home cooking. We always enjoy meeting the other guests too and sharing the days adventures with them. We are already booked in for next year - need we say more! We've lost count of the number of times we've visited the Quinta by now but needless to say after a rare year of not visiting we were back with gusto this year and received a fabulous warm welcome from the Algarve's best hosts! Having visited over 11 years we may be showing our age a bit but the Quinta only improves. Jill and Julio are constantly adding and updating to improve the guests' experience. It was wonderful to be there with so many guests that we now count as friends as well as meeting some great new people. The relaxed atmosphere makes for an easy sociable holiday for adults and children alike. There really is nowhere quite like it! Sometimes you chance upon a place in a class of its own. The Quinta das Achadas was just such a place for us. Set in a lush, tropical garden, teaming with birdlife and colourful vegetation the accommodation is very private and atmospheric. It is also within striking distance of quiet sandy beaches, the more rugged and romantic Atlantic coast and the still retreat of the mountains above. Jill and Julio are warm, generous and fun. Their home cooked dinners give the guests an opportunity to come together and make this unlike any other holiday. Their love and insider's knowledge of the Algarve are hugely inspirational and mean you don't waste any time on visiting the 'wrong' places! Thank you both for a very memorable stay. The Quinta is a special place for us & our "April in Portugal" visits are always keenly awaited. The location is lovely & there is a variety of places to visit within easy driving distance. Jill & Julio are great hosts & we have many happy memories of long evenings spent with fellow guests around the table on the evenings when Jill "cooks in"
Thanks once again for a great stay. I have just returned from a week in this lovely Quinta. The hosts Jill and Julio were wonderful. Friendly , knowledgable and great cooks. The accommodation is lovely being set in a large garden with both a pool and hot tub. All apartments are well equipped and the meals provided were of a high standard. Lovely relaxed stay in very comfortable accommodation. Great food and conversation over the breakfast and dinner table, with excellent food and a warm welcome. Highly recommended. What a lovely place to stay - Jill and Julio are warm and friendly and fun. Delicious meals and a comfortable room to come back to after exploring beautiful Algarve. We had a really lovely week staying at Quinta das Achadas. Beautiful scenery, great walks, very comfortable accommodation and wonderful hosts in Jill and Julio. The perfect antidote to the British winter. Thank you! Delightful location for a Winter Break (10 days) including an offer of a special golf deal which we shall be tempted to take up next year. Comfortable accommodation, friendly and sociable. Good, reasonably priced, restaurants nearby when not sampling Jill and Julio's excellent cuisine. We spent 6 days at this lovely, relaxing spot in early January. The apartment kitchen was stocked with new appliances and gear, the walls were hung with original art and there was a wood stove to keep us warm. The hosts, Jill and Julio, were genial and vegan friendly. We met three very interesting couples there and each day of walking and exploration ended with a visit into the Quinta's hot tub. We enjoyed a great holiday. Our apartment was comfortable and well equipped and we loved relaxing in the hot-tub at night after fabulous walks along the coast and surrounding countryside. We especially appreciated the attentions of our hosts, Julio and Jill whose lively conversation and first-class cooking made our holiday truly memorable. We shall be back! Lovely situation, set up off the road. Julio and Jill are lovely, very accommodating, nothing too much trouble. Our accommodation was spacious and cosy with wood fire. And comfortable bed.